Consumer research has shown that more and more customers prefer the convenience of being able to order food online. According to data compiled by the Interactive Advertising Bureau, more than 69 percent of customers have ordered food online at one point. In response to this growing trend, the team at Shipley Donuts is offering home delivery of their delicious baked goods across the Houston area. It’s easy to become overwhelmed when trying to settle on what yummy donuts you should order from Shipley Donuts. The bakery has a gourmet philosophy when it comes to serving their products and you won’t find convenience store style donuts within the shop. 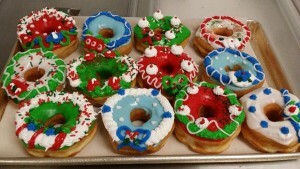 Shipley Donuts has an astounding 60 different donut recipes featured on their menu. Although the classic glazed donuts are always bestsellers, don’t be afraid to taste test many of the other varieties. The cake donuts taste amazing plain or can be sweetened up with one of the icings available such as cherry, vanilla, maple, or chocolate. Fruit-filled donuts are also popular with customers with scrumptious options including strawberry, lemon, blueberry, cherry, and many more. If you want to serve up more than donuts for breakfast, order one of the shop’s specialty bakery items such as iced nut rolls, tiger tails, bear claws, apple fritters, and old-fashioned cinnamon rolls. Although the convenience of baked fresh donuts and pastries are enough of a draw for most customers, Shipley Donuts has a large menu that has plenty of mouth-watering pastries to tempt anyone in your household. Kolaches are a bestseller at Shipley Donuts for good reason. There’s nothing more appetizing than hot kolaches made with fresh dough and filled with your favorite toppings. Shipley Donuts is the only Houston area bakery that has snack-sized versions and poppers available of this scrumptious food. Kolaches make a great breakfast choice when served with scrambled eggs or an ideal anytime food when made with sausage, cheeses, or ham. Kolaches are a good savory treat to be paired with the sweeter donuts from the menu. You can’t beat the convenience of ordering donuts online through the simple form on the Shipley Donuts website. Customers can browse the full menu of the bakery and pick what items they want delivered directly to their doors. Prices are printed next to each menu item and combo deals are available. Setting up an online order account takes less than a minute and account details can be saved to speed up checkout for future orders. Online customers don’t have to wait in line and are able to provide clear instructions on what they want ordered. Although home delivery is available through both the Downtown and Westheimer locations, you can also choose to forgo the line and arrange for store pickup. Connecting online with Shipley Donuts helps you stay up to date on all of their delicious and exciting new products. Besides the opportunity to order donuts online, make sure to follow us across social media to be the first to hear about updates to our menu and special offers. Also, don’t forget to sign up for the monthly newsletter and enroll in our birthday club. What are you waiting for? The convenience of donut delivery in Houston is a major draw to both residential customers and businesses across the area. Hot, fresh donuts can be brought right to your door and enjoyed by the entire family. Give us a call at (713) 589-3292 or fill out our form. And don’t forget to browse our extensive menu and order donuts online for delivery today!